Hotel Santa Susanna Resort is a beach hotel offering 215 rooms across five floors. The hotel features a beautiful lobby, 24-hour reception, a currency exchange service, a café-bar from 10am to midnight, a TV room and a games room. It also has a souvenir shop, a mini club as well as a buffet restaurant for all services. 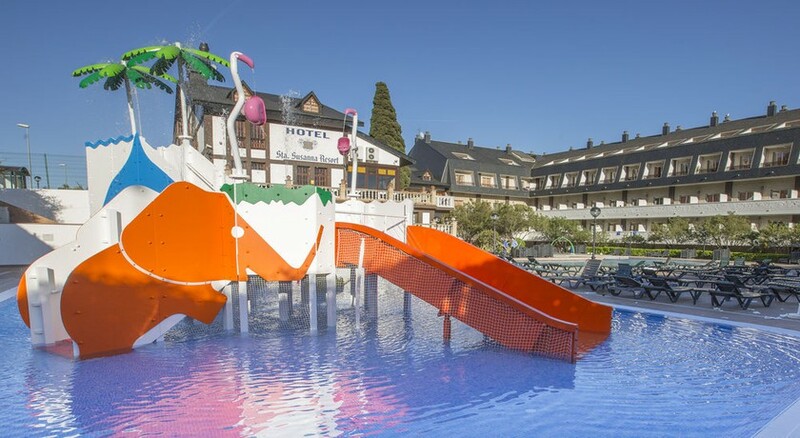 Children will have a great time at the ‘kids club’ and the park. There’s also an outdoor terrace with a Jacuzzi where guests can relax. The hotel’s on-site restaurant serves buffet meals with free wine, beer, mineral water and soft drinks*. In addition, there is tea, coffee and cookies available during 4pm – 5pm and ice creams for children between 11am – 10pm. It is possible to play billiards and table tennis (for a fee), and sports fans may pay a visit to the hotel gym (adults only). There is an entertainment program for children. 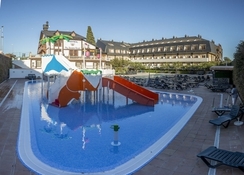 Since 2015 the hotel also offers a multipurpose outdoor court with two mini-soccer and one volleyball court. 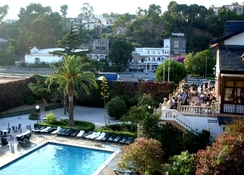 Hotel Santa Susanna Resort is located about 900m from the town centre and just over 1km from the beach. Every half hour (from 9am to 10pm) a bus runs from the hotel to the beach or downtown Santa Susana. Near the hotel you can also find shops and places of interest, as well as public transport service. Bars, pubs and restaurants are 600m from the hotel; the nearest nightclub is only 800m away. 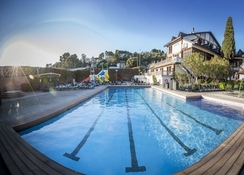 Hotel Santa Susanna Resort offers a total of 215 rooms for guests. The rooms are equipped with a bathroom with a shower, a telephone, satellite / cable TV, a small fridge (with extra charge), a hire safe and a balcony. The hotel’s main restaurant serves a variety of delicious meals at breakfast, lunch and dinner. Breakfast includes a wide variety of cold meats, eggs cooked in different ways, cereals, dairy products, bread and fruits. Lunch is also served in a great variety of hot and cold dishes and desserts. The meals are International and vary on a daily basis. The restaurants also serve local cuisine dishes so the guests can have a taste of the regional dishes. Free wine, beer, mineral water and soft drinks are served by the restaurants. The bars present throughout the resort serve unlimited all-inclusive drinks including locally produced alcoholic and soft drinks. The pool-side bar also serves light snacks, tea, coffee and cookies. The spa includes a fitness centre and hammam. On site, the tourists can play billiards and volleyball. The hotel arranges for fun and games for younger guests in the games room. Cycling and horse riding opportunities are available in the vicinity of this property. 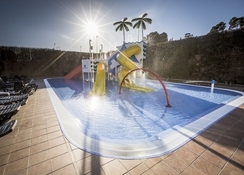 The hotel offers a large outdoor swimming pool and water slides for children. This holiday from start to finish was amazing, right from booking it had a very personal feel and the customer service advisors really help with your needs. The hotel was amazing and the people even better, what a lovely place to go and spend some time in the sun. Highly recommended !!! Had a lovely break couldn't find any fault for the money it was well worth it.